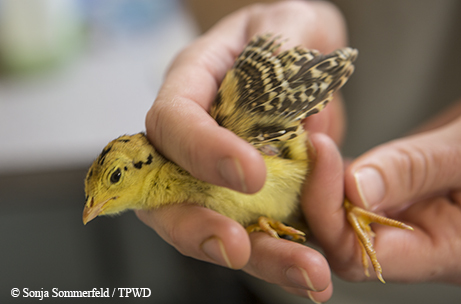 Breeding program restocks chicks in a battle to bring Attwater's back from the brink. Come spring, the Attwater’s prairie-chicken intensive management area at Fossil Rim Wildlife Center kicks into high gear. 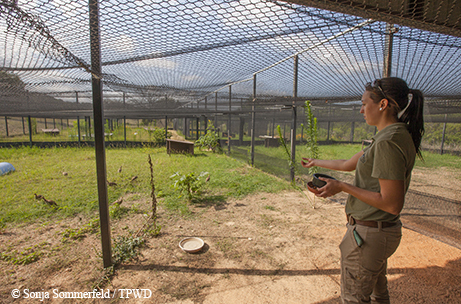 Since 1992, the critically endangered birds have been safeguarded within pens here to do what they’ve done for eons: propagate their species in a most colorful and dramatic way. As they do on breeding display grounds (called leks) in the wild, but protected here from predators, the male birds perform an elaborate courtship ritual. They drum their feet in a distinctive dance, inflate bright orange air sacs on their necks and emit a booming sound, all to attract a female. The birds then mate and produce eggs that represent the future of the species. 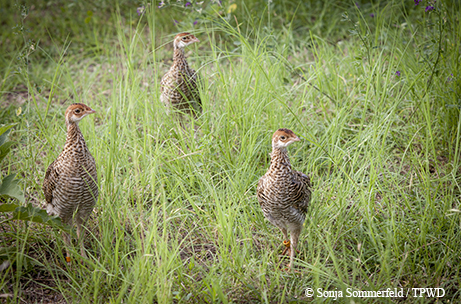 At Fossil Rim (near Glen Rose), these captive birds do it all under the watchful eyes of humans determined to save the Attwater’s prairie-chicken from almost certain extinction. Avian curator Janet Johnson oversees the operation — an incubation facility and an elaborate system of cages and covered pens that come alive in May and June with hundreds of tiny birds at various stages of growth. In one area, eggs are carefully incubated. In another section, Johnson and her crew monitor chicks. Outside, a series of pens protects larger birds while allowing them to be exposed to the elements. The healthiest birds will be released into the wild at the last remaining tracts of suitable habitat in South Texas. The captive breeding facilities here and at several other locations in Texas represent the last chance for a bird that is one of the most endangered creatures in North America. Technically a grouse, not a chicken, the bird was named for naturalist Henry Philemon Attwater, who collected specimens of the species at the request of noted ornithologist Charles Bendire in the 1890s. Bendire conducted technical studies of the specimens, determining that the bird was a subspecies of the greater prairie-chicken. He named the bird after Attwater in gratitude for his assistance. Attwater was a vocal proponent of conserving the species. Before he died in 1931, he wrote an impassioned letter to Will Tucker, who headed the Texas Fish and Game Commission, the precursor to the Texas Parks and Wildlife Department. Attwater implored Tucker to close the hunting season on the bird to protect its dwindling numbers, but it would take another six years to close the season for good. At the turn of the 20th century, a million Attwater’s prairie-chickens roamed 6 million acres of coastal grasslands in Louisiana and Texas. Over the next century, human population growth led to different uses of the land. Vast areas were tilled up for rice fields; urban areas sprawled across the landscape; cow pastures replaced prairies. Today, less than 1 percent of the bird’s coastal grassland habitat remains. Habitat loss has been exacerbated by the devastating impact of invasive species. Chinese tallow trees, planted in the early 1900s, proved to be aggressive invaders, displacing native plants and grasslands. Fire suppression has allowed brush species to dominate prairie land. Fire ants are a more recent threat, emerging on the Texas landscape in the late 1950s. The tiny terror has marched across Texas, wreaking havoc on native insect ecosystems. Biologists at the refuge knew they had to do something. In a wildlife version of a Hail Mary pass in the last seconds of the game, they re-upped a captive breeding program. Morrow collected eggs from the wild to jump-start the second attempt to breed the bird in captivity. 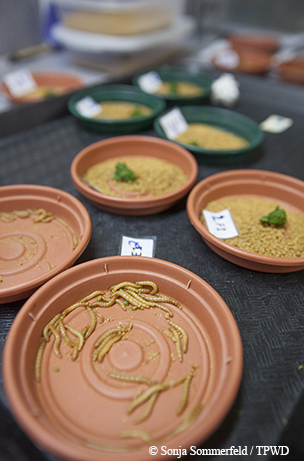 The goal was to preserve as much of the genetic diversity of the wild population as possible, and to provide stock to repopulate depleted or extirpated populations. 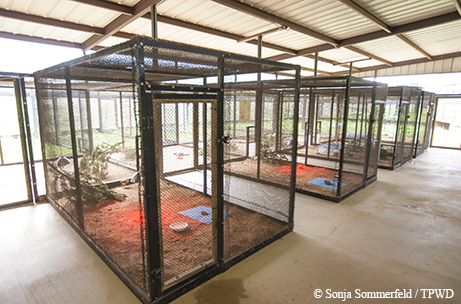 After extensive trial and error, incorporating new learning along the way, the captive breeding program took hold in 1993, and Fossil Rim found success in breeding healthy chicks. Additional breeding facilities were added in 1994; others signed on in 1996. Today, captive breeding flocks thrive at Fossil Rim and at zoos in Tyler and Houston. Since the first release of captive birds in 1995, 3,806 birds have been released back into the wild. Most of the birds have been released at the refuge, with some released on private land with high-quality coastal grassland habitat. Birds were released at the Nature Conservancy’s Texas City Prairie Preserve until 2012, when the last of that population sputtered out. Today, there are only two places in Texas where the bird still survives: the national refuge and on private land in Goliad County. Figuring out how to successfully breed the birds in captivity is just one obstacle. It’s a disheartening fact that approximately 80 percent of the released birds perish before they successfully breed in the wild. Morrow wrote his doctoral dissertation on the Attwater’s prairie-chicken and has spent his entire career studying and working with the bird. He’s seen it all when it comes to the ups and downs of attempting to recover a species whose numbers have dwindled to perilous lows. 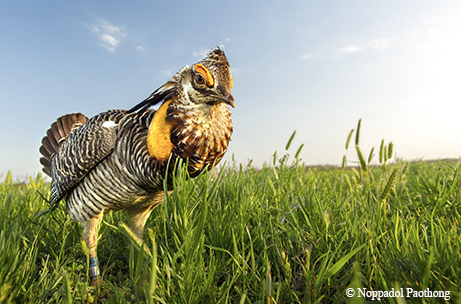 The Attwater’s prairie-chicken is near the bottom of the food chain, and, as a ground-nesting bird, is at the mercy of every predator on the landscape, from birds of prey to skunks. But perhaps the biggest threat is the smallest predator: the imported fire ant. Morrow’s subsequent research study confirmed that fire ants were decimating the insect population, the primary food source for baby chicks. The tiny birds were starving to death. Armed with that knowledge, they began treating release sites with a pesticide that would take out fire ants, but not harm the chicks. While the pesticide’s no cure-all, researchers believe they can implement management strategies that will significantly increase the bird’s chances. In 2017, the spring bird count documented just 42 birds in the wild. That disappointing number resulted from significant bird mortality from catastrophic flooding in April 2016 that washed away many of the birds on the nest. Hurricane Harvey had an equally devastating impact in 2017. A notice on the refuge’s website in January 2018 stated that of the 29 individual hens being tracked with radio collars before the storm, only five were confirmed alive after Harvey. An additional three went missing since the storm. The official count this spring documented 26 birds in the wild. Morrow is optimistic despite the losses. “We are fortunate to have the safety net of the captive rearing program, and I am confident we can and will rebuild wild populations in the coming years,” he says. Former refuge manager Rossignol says the decline of the prairie-chicken is a sign of a larger problem. For those who have worked in the trenches year after year, it’s been a frustrating and sometimes heartbreaking journey, but they still have faith in the project’s success. Morrow estimates it would take about 500 birds scattered throughout the landscape to establish a toehold so the numbers can grow. It’s obviously an uphill climb. More birds will need to be captive-bred, and there are plans for another breeding facility to come online in the near future. 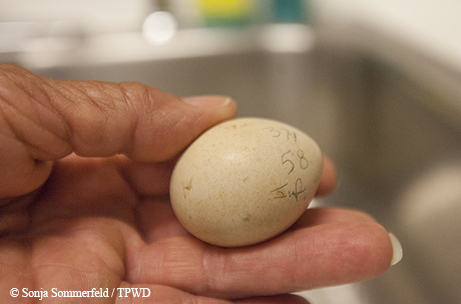 Back at Fossil Rim, Johnson and her team will continue doing what they’ve been doing since 1992: producing as many healthy chicks as they can.